As a small-business owner, you may not have the budget to purchase industry leading software, however you still want to process images and photos for your website or offline media. These feature rich photo editing applications are capable of enhancing your images, creatively adding effects and filters, without breaking the bank, with many available free. 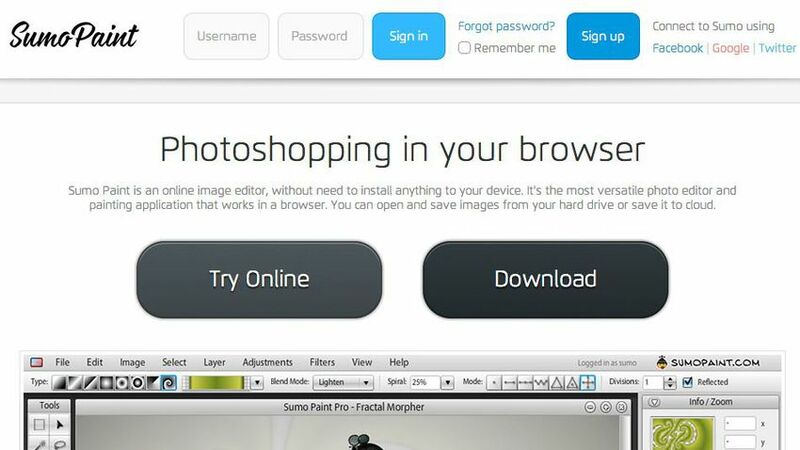 We've collected 14 of the very best photo editing applications. Many of these are browser-based, so there's nothing to install or download; you can upload images directly from the computer, transfer from your social networks or retrieve them from online galleries. Whether you're looking for extensive editing power or just a quick way to enhance images for social media, we have you covered. 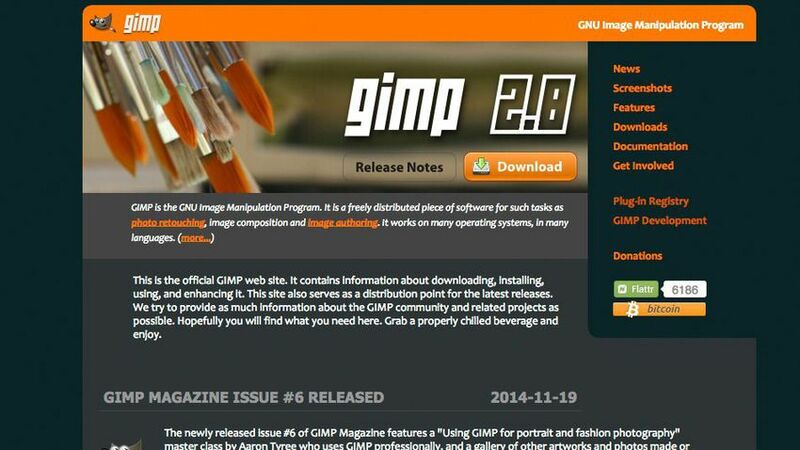 GIMP is a versatile image editor that allows you to customize the application view and behavior to suit your requirements. Starting from the widget theme, you can change colors, widget spacing and icon sizes, as well as customize the tool sets. The interface is modularized into stackable "docks," and a full-screen mode makes it simple to preview your artwork. Photo enhancement is easy, with distortion correction, cloning and healing tools, batch processing and much more. GIMP is expandable and extensive, with the advanced scripting interface allowing everything from simple tasks to complex image manipulation to be easily completed. Fotor, launched in 2012, is a powerful, easy to use photo editing tool. With a suite of tools you can make quick and easy edits to adjust lighting, brightness, contrast, saturation, sharpness and more. Fotor can quickly change the look of your image with built-in effects like Lomo, blur, stickers, color splash, mosaic and tilt-shift. Extensive photo retouching features include tools for skin smoothing, photo reshaping, blemish removal and more. Fotor offers a professional-level suite of features, with a clean, intuitive interface and workflow to enable you to quickly and efficiently edit images for your business. It's available on iOS, Android, Mac and Windows platforms. Sumo Paint is an online image editor that provides -- directly in your browser -- a fantastic tool set, ranging from the basic to advanced editing tools. Unlike other apps, Sumo Paint boasts an online community of over 4 million users who share, remix and rate the artwork of other members. You can open files from your computer, Sumo Paint or a URL, and edit with a wealth of tools, including paint brushes, erasers, shapes, pattern palettes, eyedropper, paint, text and a variety of blend modes. You can also utilize the curves tool to control colors and contrast, and levels for adjusting tones. 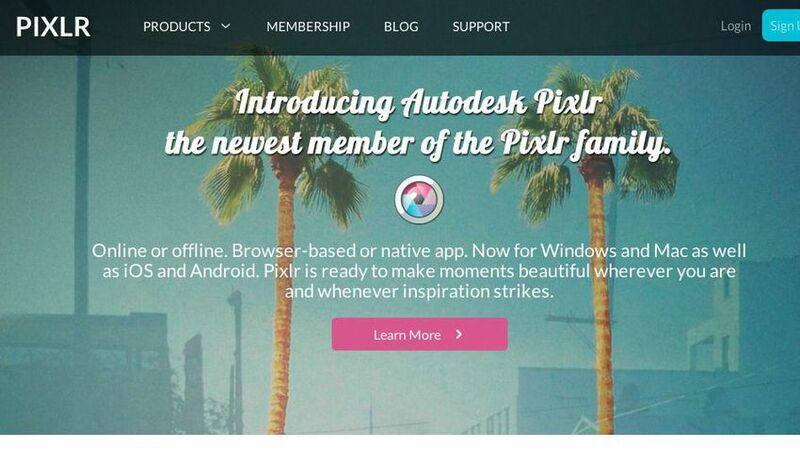 Pixlr, available for web, desktop and mobile platforms, gives you precise control over your image editing process. You can stylize images any way you want and add effects like crosshatch, halftone and dapple, with hundreds of overlays, stickers, and borders to choose from. Use familiar blending modes with double exposures and overlays along with masks to add greater control. Apply linear or radial gradient masks to blend effects or images, and use the editor both online and offline. Pixlr Express, available for both iOS and Android, lets you quickly crop, rotate and fine-tune any image right from your mobile device. 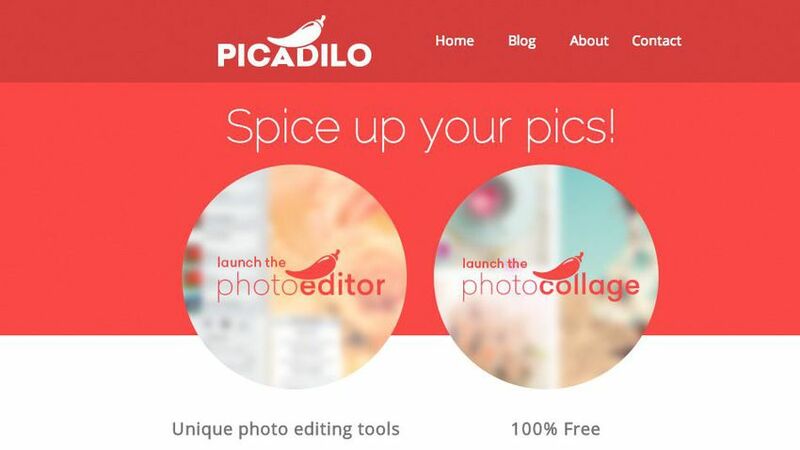 Picadilo is an online photo editor featuring an array of unique tools, including brushes, selections, text, effects and more. 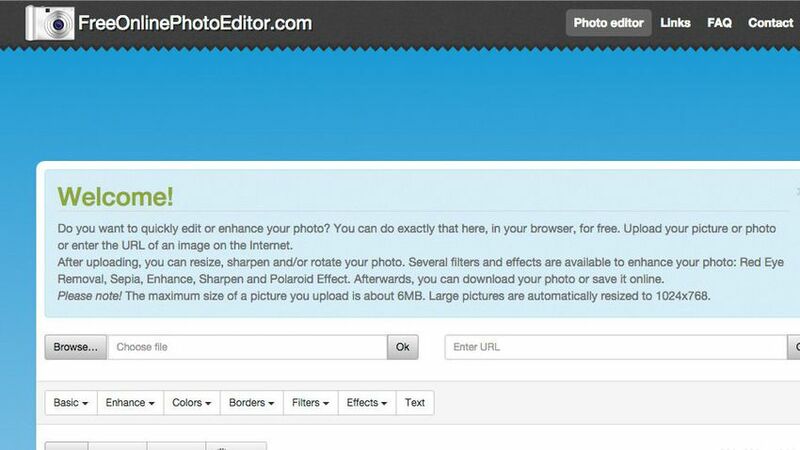 Once you upload an image you can resize, crop, retouch, add text and filters and even put frames around your image. 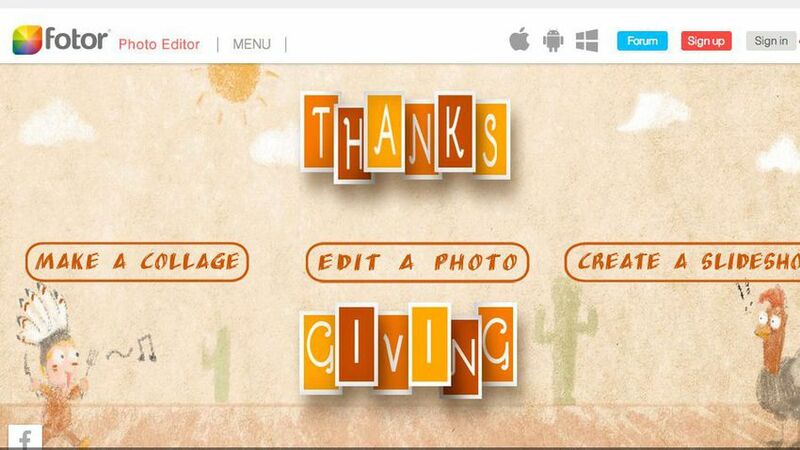 With more than 100 fonts, 40 photo effects, 19 retouch tools and 140 unique stickers, there are enough features to easily edit any image.You can adjust the exposure, especially for useful for either very dark or bright images, also useful is the Magnify tool which lets you zoom in to any part of your image. For easy sharing, Picadilo allows you to add captions and send photos straight to Facebook, or you can print right from the browser. 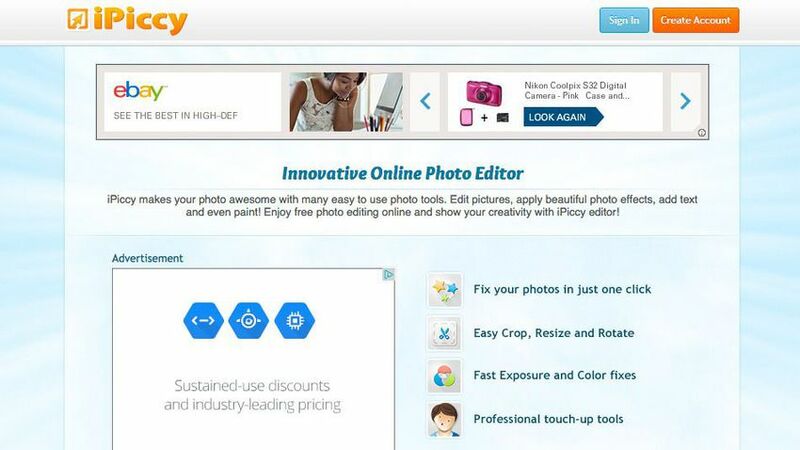 iPiccy is a browser-based photo editor and sharing application that lets you quickly and easily edit, enhance, share and print all of your images. There is no installation required, just upload any image and get started quickly right in the browser. It features an automatic photo fix and retouching tools and allows you to crop, rotate, resize, adjust and straighten images. 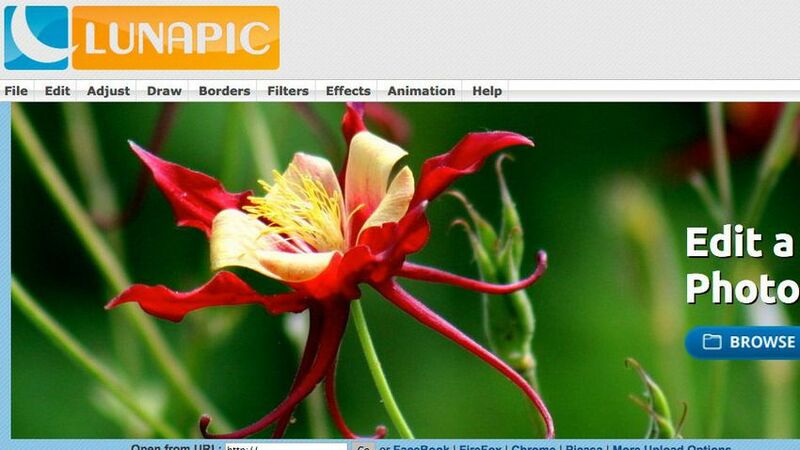 iPiccy allows you to get truly creative with special effects like painter, vignette, pencils and more in various work modes, including Basic Editor, Effects, Retouch, Blender, Painter and Textures. 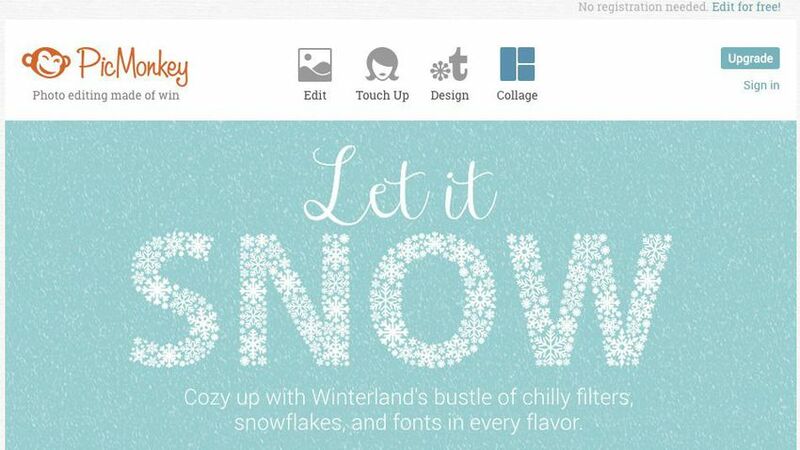 PicMonkey is a free photo editor that works in your browser, with nothing to download or install. You can fix common issues like red eye and overexposure, add beautiful filters and touch up facial features to create the image of your choice. Transform your images with one-click filters, light effects and fine-grain controls. Images can be uploaded directly from your computer, or from Dropbox, Facebook or Flickr. The Basics tab lets you make general adjustments, while the Touch Up tools include blemish fixes, blush boost, brighten, air brush and more. There are also PicMonkey Editors for Facebook and Google Chrome, along with an API which lets you integrate PicMonkey editing directly into your website or application. BeFunky is a photo editor and collage maker that allows you to crop, resize, add frame, and easily adjust the color, brightness, contrast, saturation or sharpness of an image. Touch-up tools include red-eye reduction, blemish fix, clone and more, with hundreds of effects to enhance your images. You can select a file from your computer, Facebook, webcam, Flickr, Photobucket or Picasa. 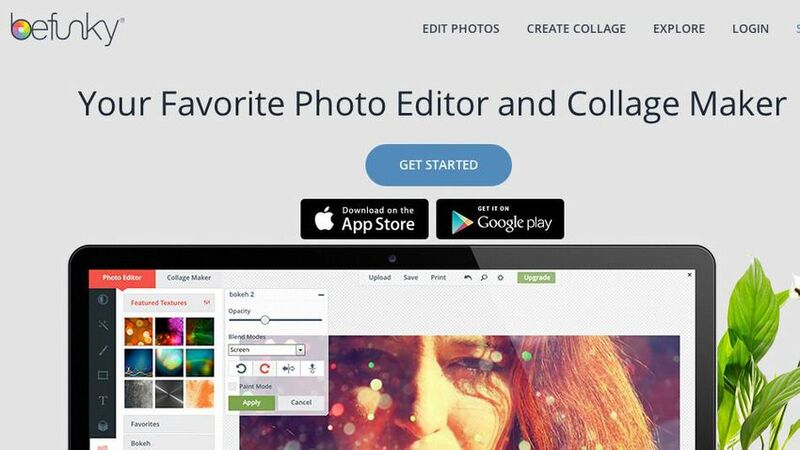 The BeFunky mobile apps for iOS and Android allow for seamless photo editing on the go. The Gallery lets you explore a variety of images in categories like style and nature, providing a wealth of inspiration. 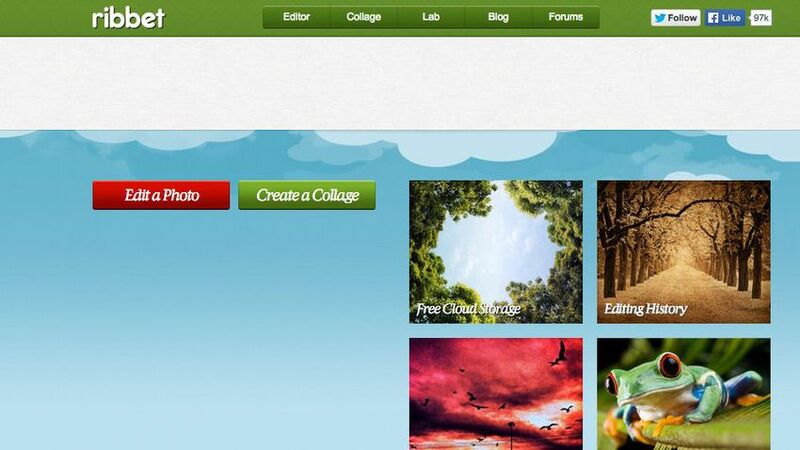 Ribbet is an online photo editor that offers free cloud storage for all the images you upload and edit. As it works in your browser, there is no software to install, although you can choose to use a Chrome web app, Toolbar button or Facebook app. Your edit history is stored, so you can undo, move around and delete elements, change text and add elements to photos imported directly from social media, webcams or any URL. With Ribbet you can fix your photos with a single-click and fine-tune changes with advanced controls as well as crop, resize, rotate and add effects and filters. Using the Ribbet API, you can even put the photo editor into your website or application, no registration or API key required. Paint.NET is a free image and photo editing software, available for Windows systems, which features an intuitive user interface with support for layers, special effects and more. You can enhance your images with everything from blurring, sharpening and red-eye removal to noise reduction, rotate and zoom. Other adjustments include brightness, contrast, hue, saturation, curves and levels. Every action you perform on an image is recorded in the history window, with unlimited memory, so you can undo and redo actions as needed. 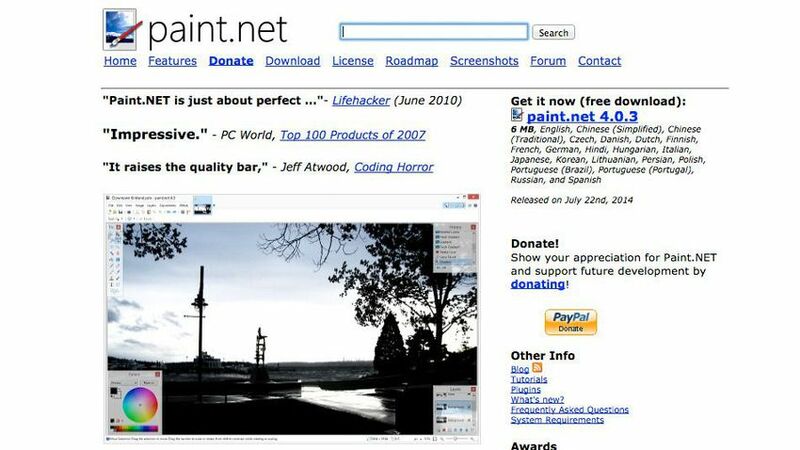 The active online forum boasts a friendly, passionate, expanding community of Paint.NET enthusiasts. 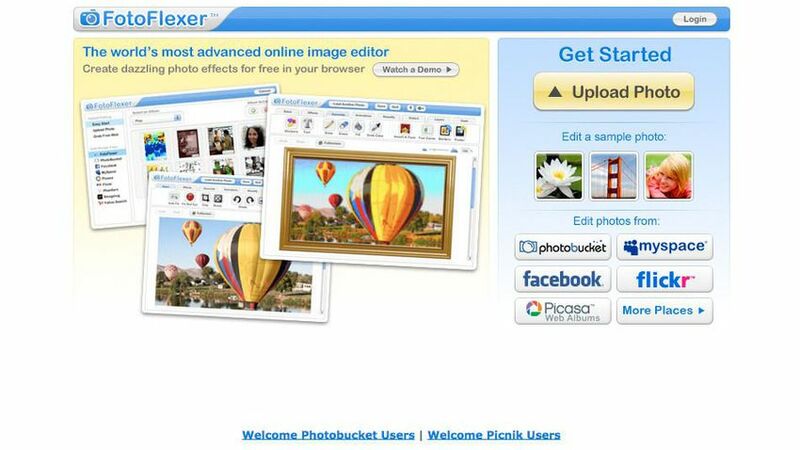 FotoFlexer is an advanced online photo editor that allows you to upload and work with images from your own computer as well as online accounts like Photobucket, Facebook and Flickr. Along with basic editing features such as red-eye removal, crop, resize and flip, there are advanced tools like smart resize, recolor, cutout, scissors, curves and morph. The interface is divided into tabs, each of which contains between eight and 20 effects that can add borders, fix mistakes and save the image in either JPG or PNG format when you're finished editing. FotoFlexer also offers an Android version, which is free to try, allowing you to fine tune your captured images. LunaPic is a full-featured online editor that allows you to upload images from your computer, Facebook, Picasa and Dropbox and save to Imgur, email, Tumblr and more -- without relying on Flash, Java or any other plug-in to work. With a large array of tools and effects, it can help you create some highly creative images. Once you've imported a file, you can use the basic editing tools such as draw, zoom, rotate, paint, gradient and crop to change the look of your image. You can also use LunaPic to create animations, changing the speed or the loop, adding or removing frames, and add effects. 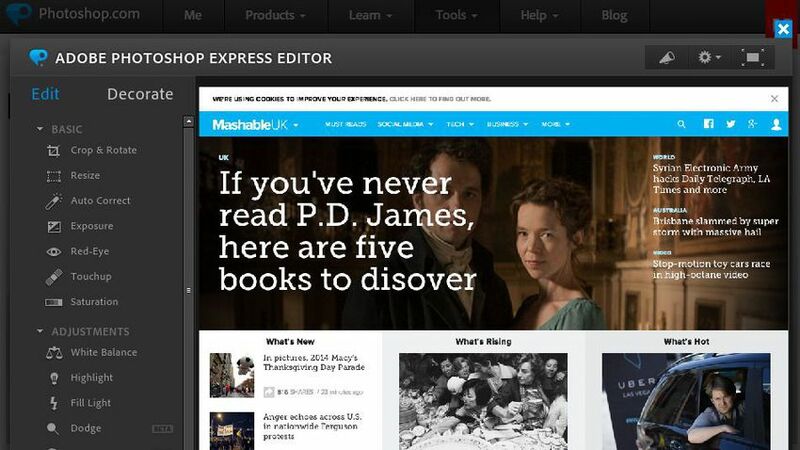 Photoshop Express is a Flash-based editing application, available both online and on iOS, Windows and Android. It makes your images look amazing, with options for quick fixes, corrections, creative enhancements and more complex effects. Photoshop Express features numerous easy-to-use functions and basic tools, including crop, rotate, auto correct, exposure, red-eye removal and saturation. Along with making adjustments to your image, you can add effects such as pixelate, hue, black and white, tint, sketch and distort. For simple and quick image editing, Photoshop Express works superbly well. 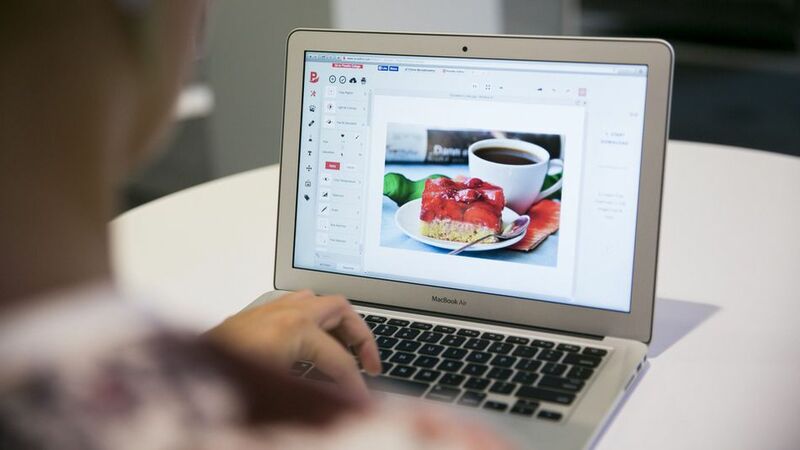 With the Free Online Image Editor, you can quickly enhance or edit images in your browser. Just upload your image or photo or enter the URL of an image from the Internet; once uploaded, you can resize, sharpen and rotate. There are several filters available, including sepia, Polaroid, Lomo, vintage and tilt shift, along with basic editing tools like red-eye removal, brightness, contrast, sharpen, blur and crop. You can add text to your image, changing the size, color and rotation. Once you're finished editing, you can save as PNG, JPG, GIF or PDF, with the option to print or email the finished image.